Posted by Iris Bella on 1/19/2016 5:10:21 PM. Some Android users want to switch to iPhone but hate to part with data on their old Android. 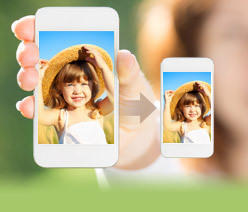 Transferring the existing data from their old Android phone to the new iPhone is a must-to-do thing for almost every person thinking of moving to iPhone. However, this transfer process can be a bit trickier, which make some people to be afraid of upgrading their old phones to the latest model they desire. Actually, with the current technology, one should not worry about upgrading from Android to iPhone. 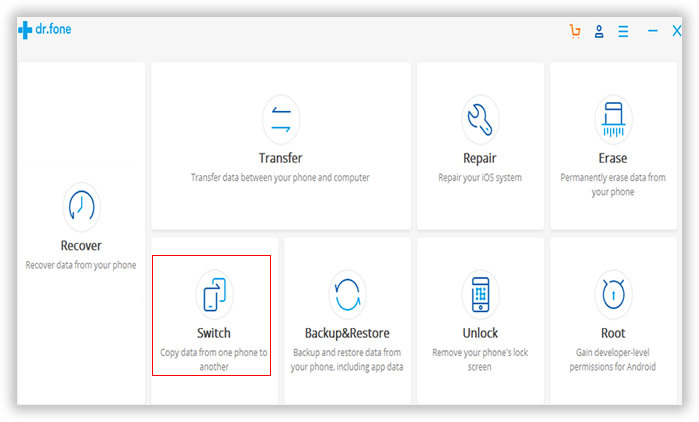 Today's technology offers some ways for mobile users to transfer data between phones with different operating system, making it possible for them to safely move all their important content. 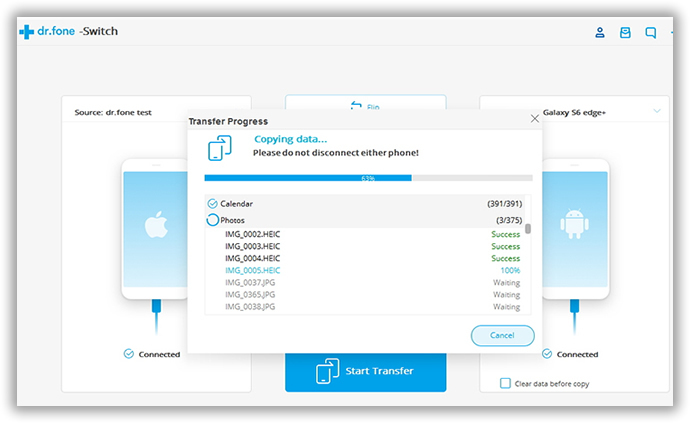 Keep reading this article to know how to transfer data from Android to iPhone using Mobiledic Phone Transfer, excellent mobile phone transfer software. Mobiledic Phone Transfer allows users to migrate easily from one phone to new one and move all their essential information along the way. It is an amazing program that can work on both Windows and Mac. The software is functional and compatible with all iOS and Android, the two most popular mobile operating system on the world. It makes it a breeze to transfer data between that include text messages, call logs, contact and media files such as videos and photos. In addition, it enables users to create back-ups of their data that they have stored on smartphones. 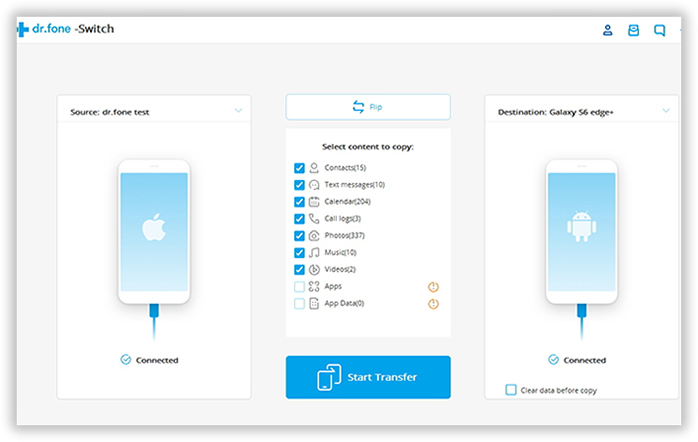 Let us have a look at how this app works and how to transfer data from Android to iPhone using it. You can download the program by clicking download button above. There are a Windows version and Mac version available. So you need to download the right one and install it on your computer. Follow the default instructions and open the program after installation is completed. And click Switch from the options. The program uses ADB to access file system on Android phone, so you need to connect both phones to the same computer with USB cable. Make sure USB drivers are properly installed on that computer. When the two phones were well connected, Phone Transfer will show their names on the main screen. The source phone is the Android phone you want to transfer data from. And the destination phone is the iPhone. If the position was wrong, click Flip button to change positions. After that, the program starts to scan and analyze the whole system on Android. This will take a few minutes, please be patient. After scanning is done, there will be numbers displayed behind category name. You can transfer music, contacts, text messages and a few other things between Android and iPhone. Select the files you wish to transfer. Finally, click Start Copy to begin the transfer process. In conclusion, Mobiledic Phone Transfer is a great way people can transfer data between smartphones. It is among the few pieces of the applications that can help people to move their text messages and call logs from one handset to another. Besides, the software is straightforward to use, easy to set up, and with extremely user-friendly UI. Moreover, there are no complications in transferring data between the two different operating systems: Android and iPhone. File Type: Contacts, Photos, Music, Text messages, Call History, Calendar and Videos. Iris Bella is the Founder and Editorial Director at Mobiledic Studio. You can also find her on social network. Copyright © 2016 www.mobiledic.com. All rights reserved.